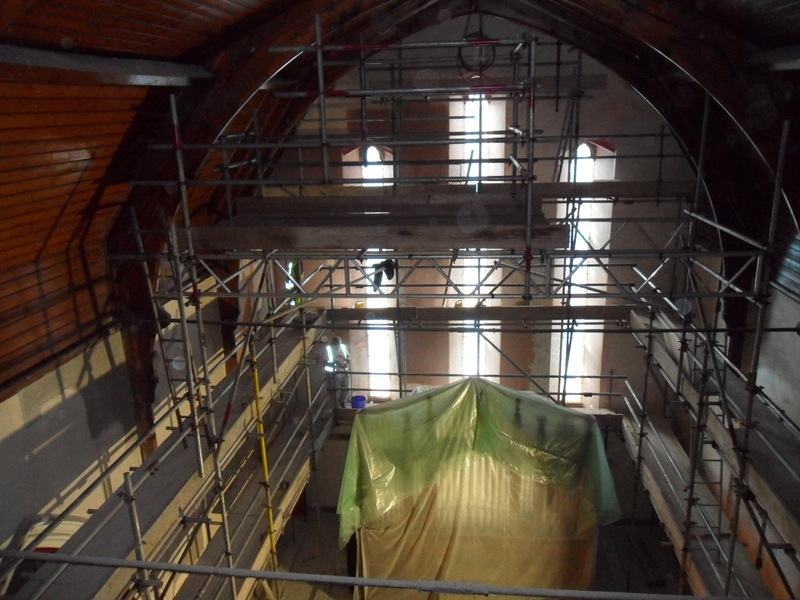 Some photos taken this week to show the ongoing redevelopment of St Marie’s Church. 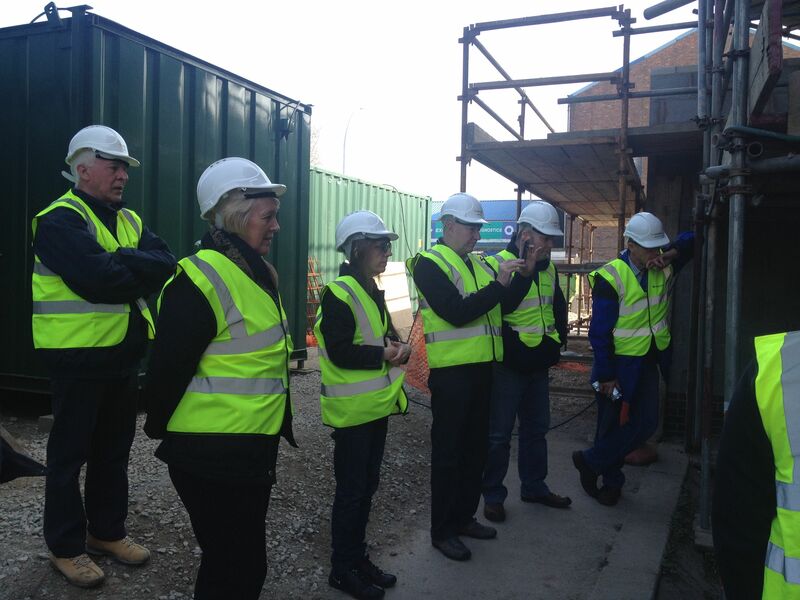 The photos were taken by Dave Clark from John Turner Construction Ltd. Thank you, Dave! 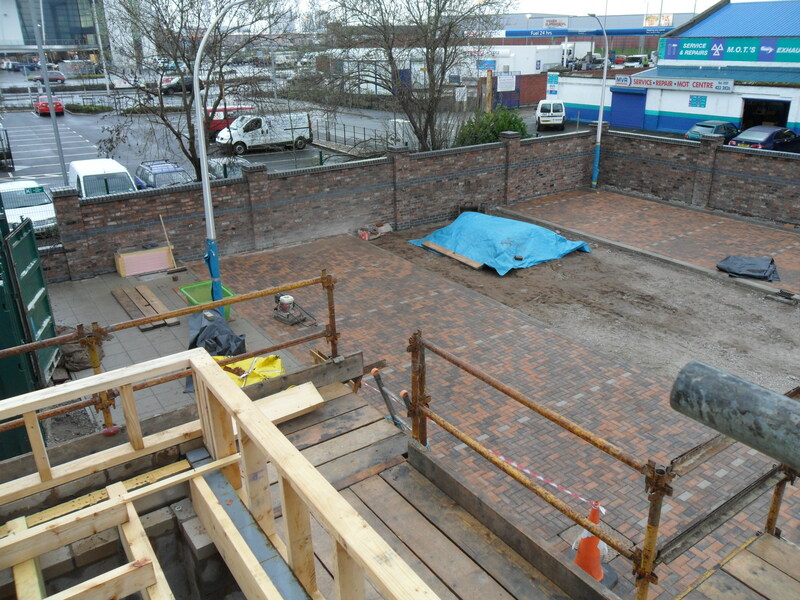 A shot from the roof which shows progress on the car park. 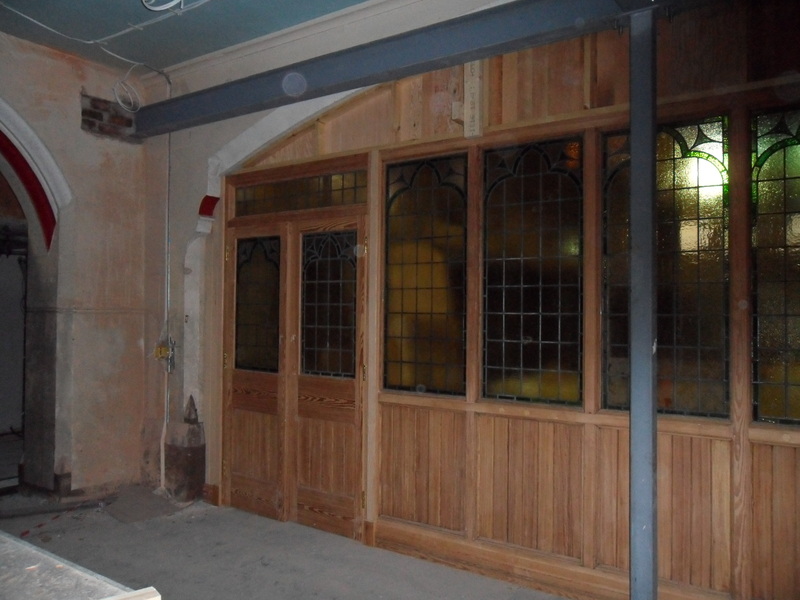 The refurbished partition wall, now positioned below the organ loft. 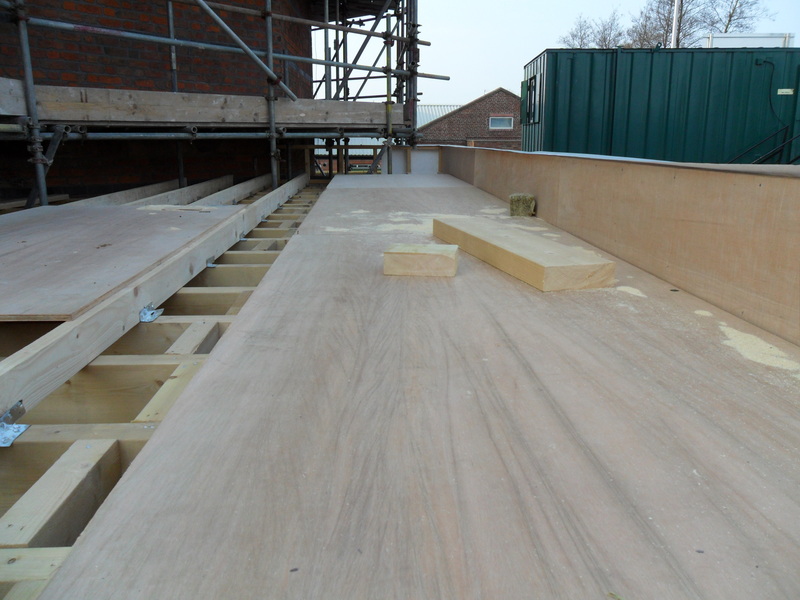 Laying plywood decking to the new extension roof ready to receive insulation and the single ply water proof membrane. 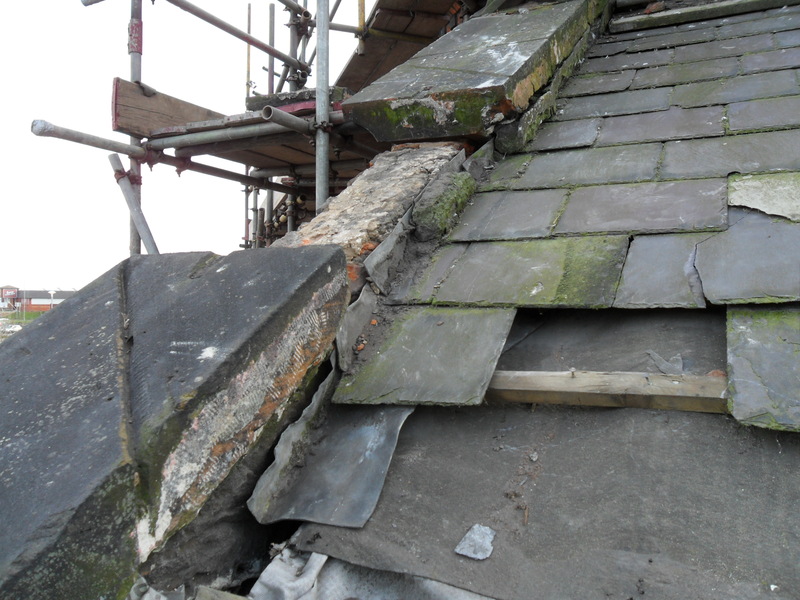 Parapet ready to receive new stone coping. 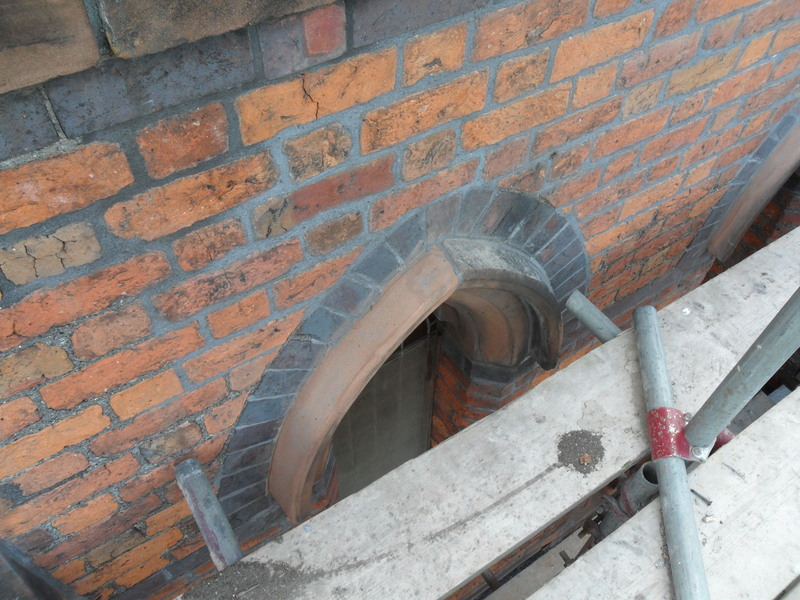 Patch pointing to existing brickwork including gothic stone arched hood repair. Few of us will have the opportunity to be this high up in the building. The organ can be seen below the dust sheets. 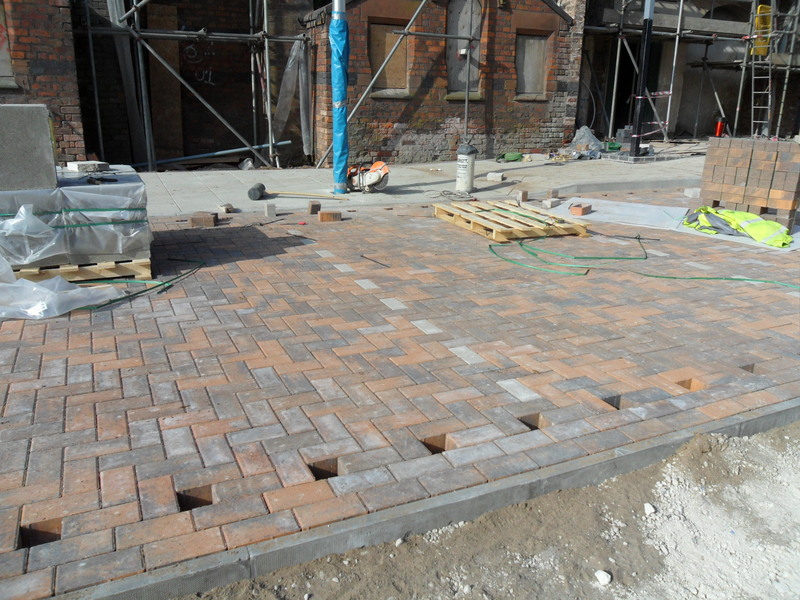 Example of Coniston Blue Slate scalpings for the perimeter feature border to the new car park, in keeping with the blue brick banding to match the Church’s features. 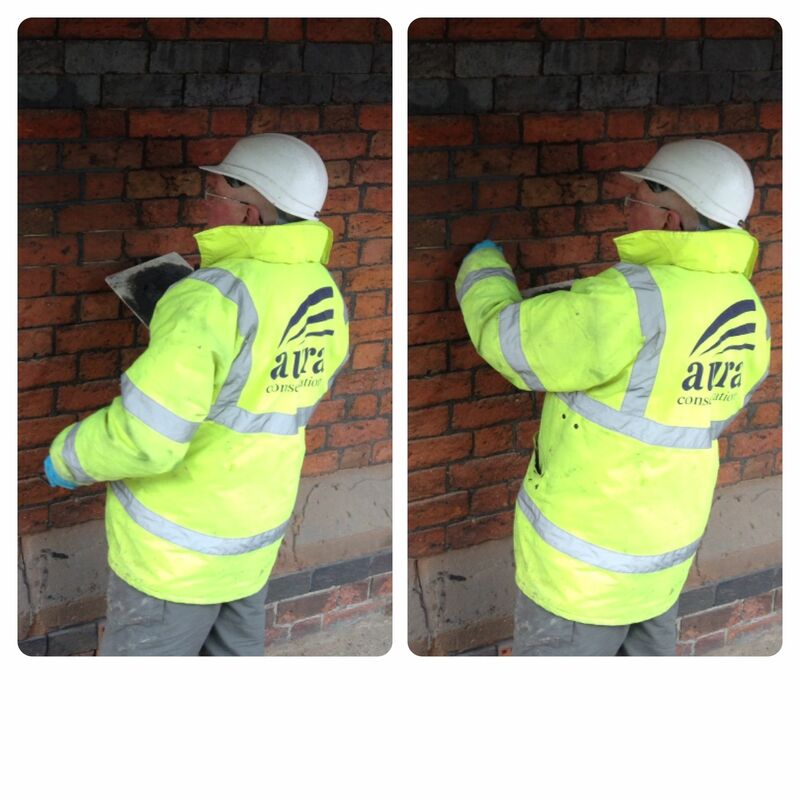 Some of the best action from this week, as captured by Dave Clark from John Turner Construction Ltd. 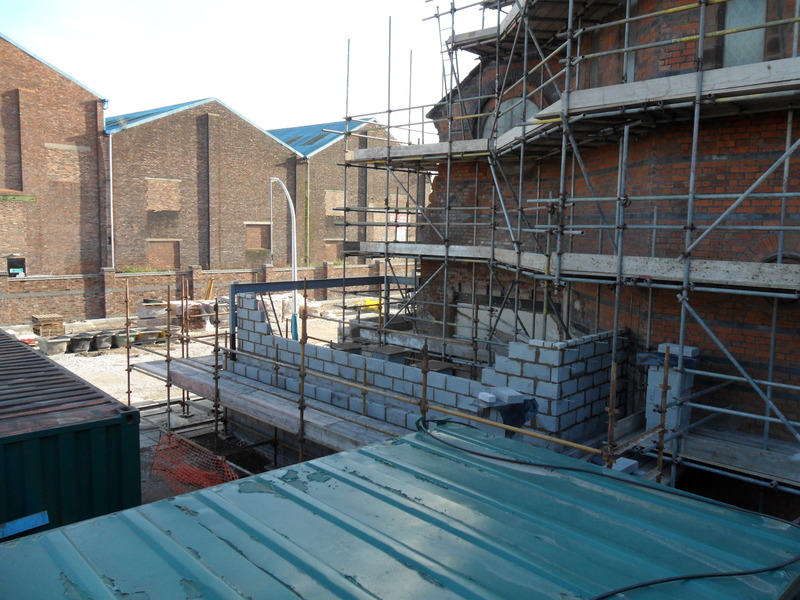 The extension (which will be the entrance into St Marie’s) starts to take shape. The car park spaces are looking handsome already. 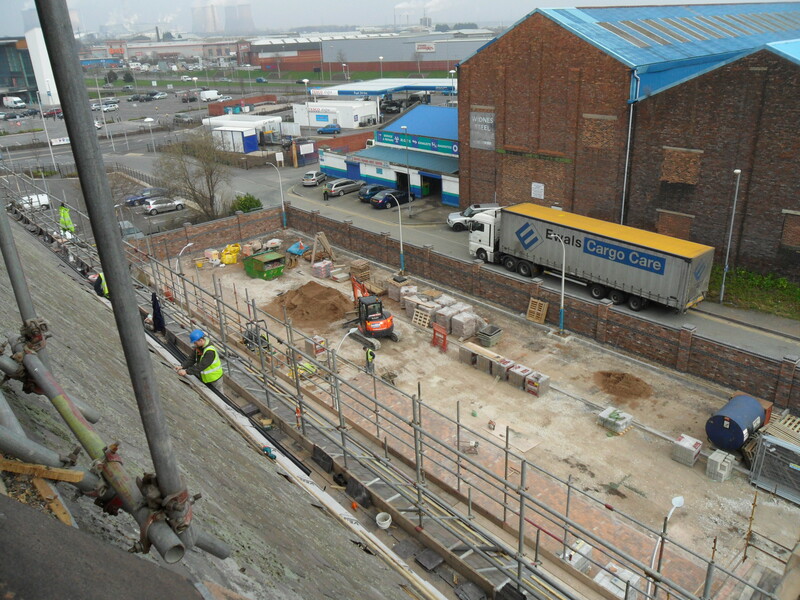 The view from the Bell Tower showing work on the roof and the car park. 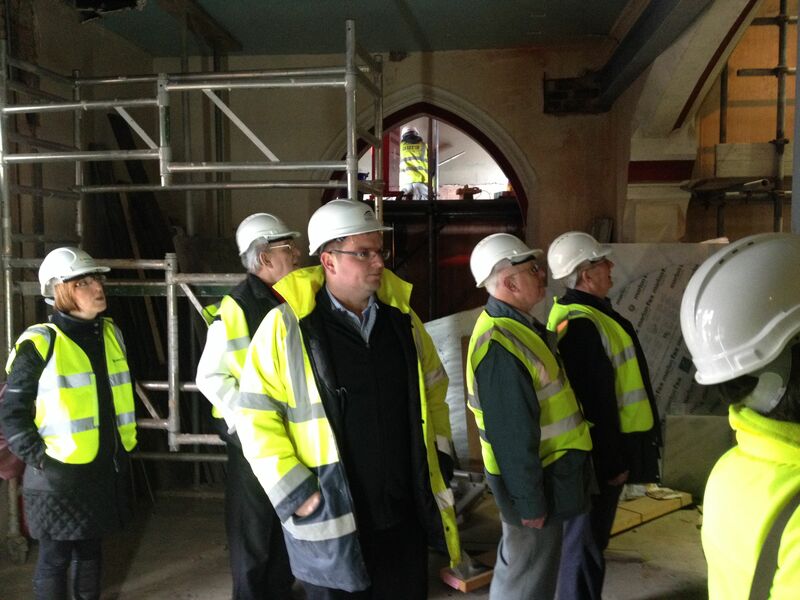 Another quick update on another fantastic heritage workshop based at St Marie’s Church. 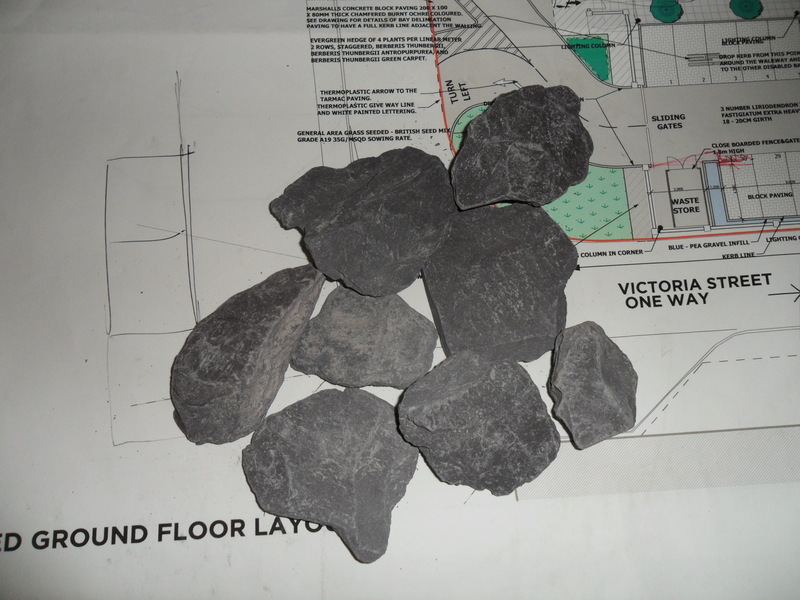 This one will be Friday 4th April (starting at 13.30) and the topic is Stone Replacement. 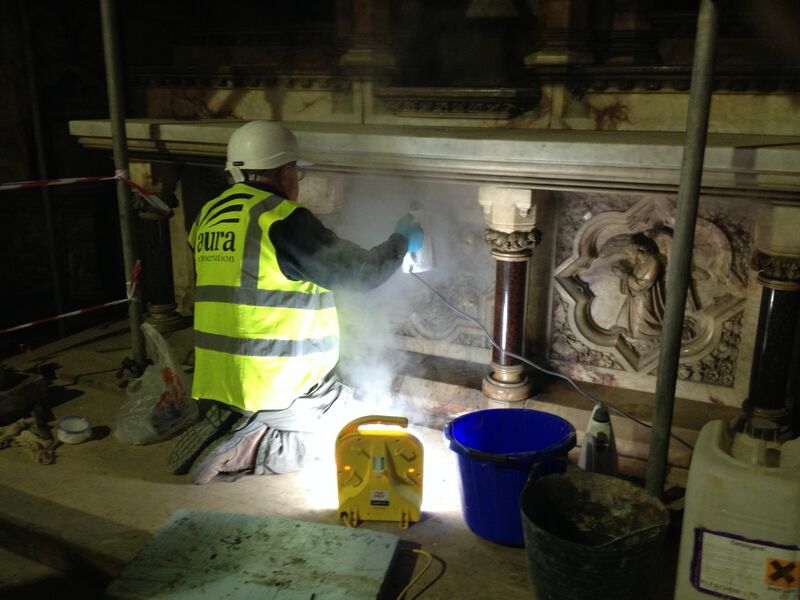 Heritage experts from Aura Conservation will demonstrate the safe removal and replacement of damaged stone inside the Church. Places are very limited for this workshop (there’s a maximum of 8 attendees) and will be distributed on a first come, first served basis. 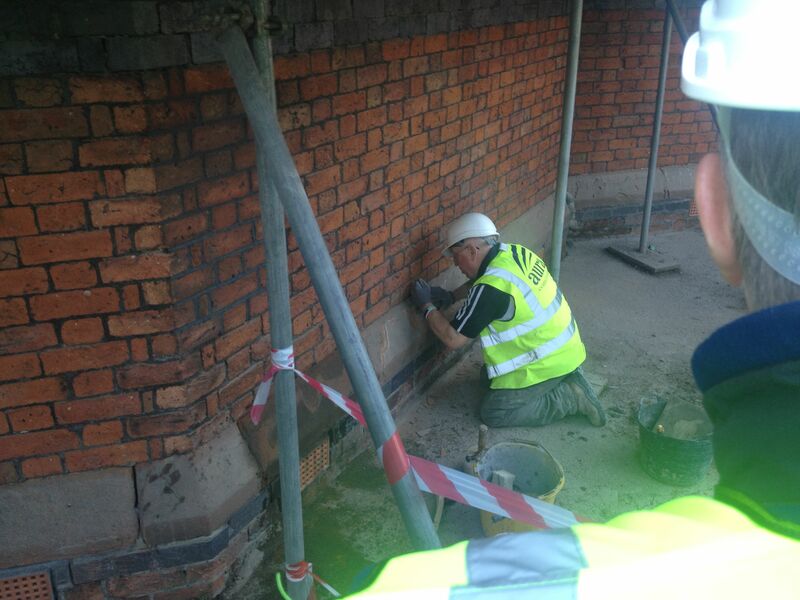 The workshops will be jointly hosted by Halton & St Helens VCA, Aura Conservation Limited and John Turner Construction Group and are supported by the Heritage Lottery Fund. 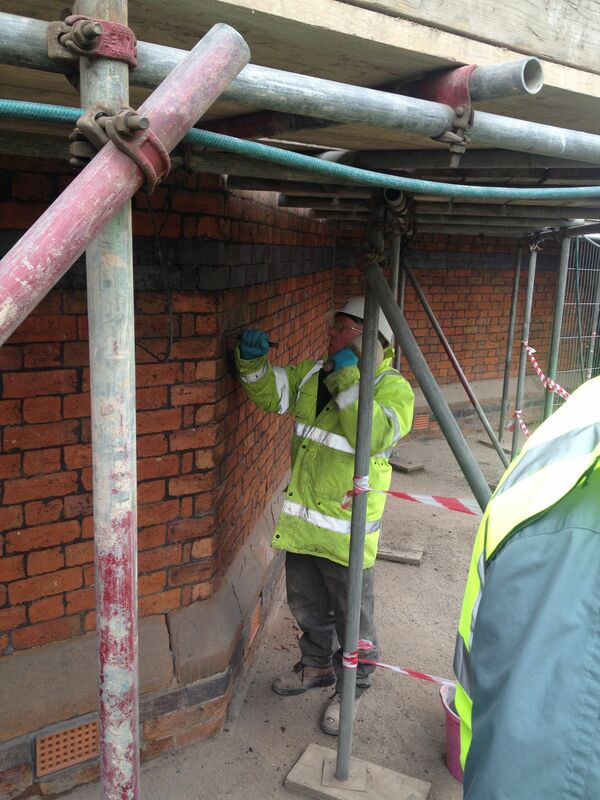 Would you be interested in finding out about the techniques being used in the redevelopment of the building? 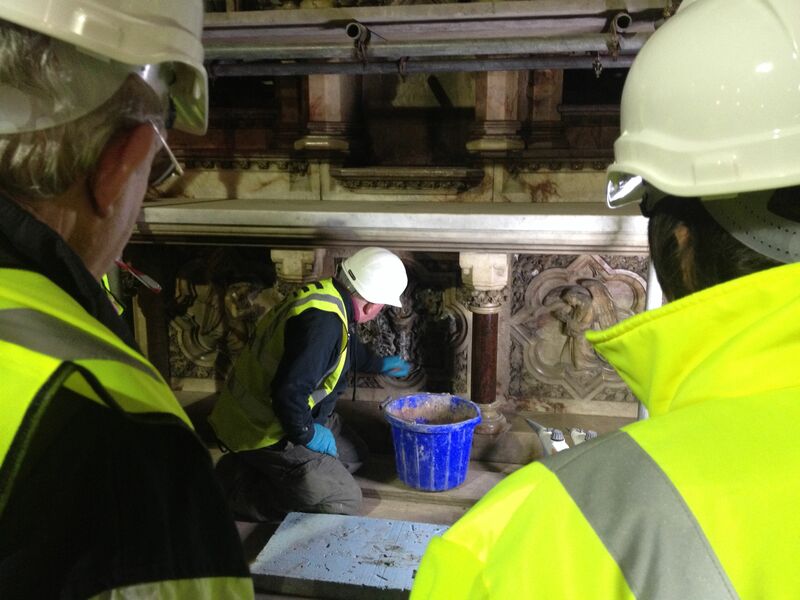 If so, would you like to see some of our heritage experts at work? Halton & St Helens VCA are planning another workshop event. 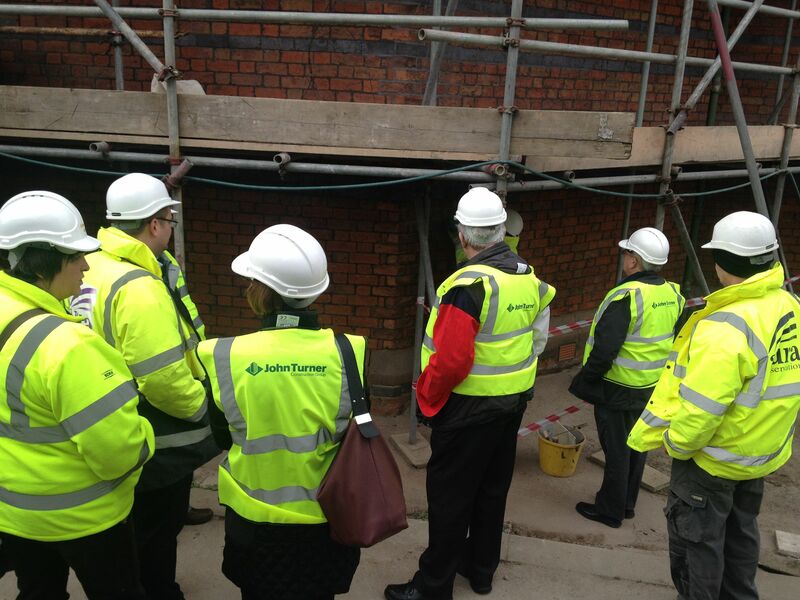 This one will be on Wednesday 26th March from 10.30am and we’d be thrilled if you wanted to join us on site. The topic for this workshop will be Joinery. 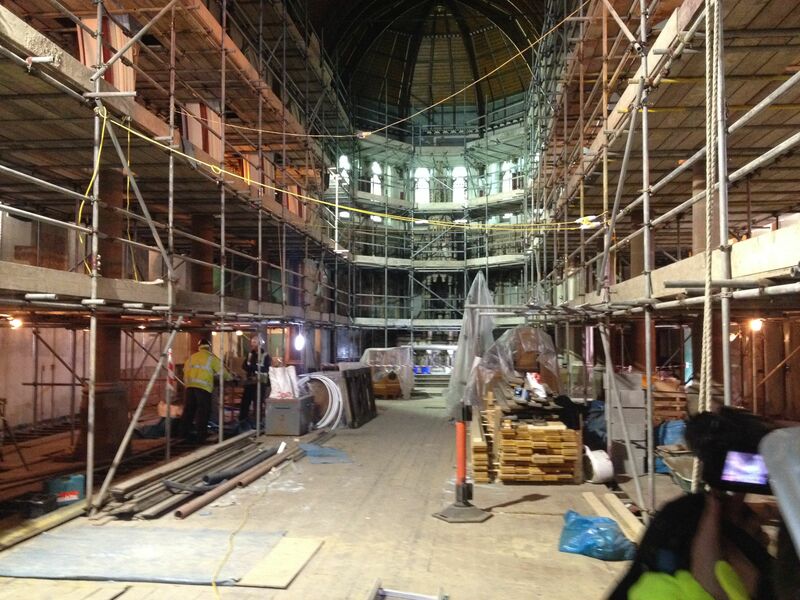 If you’re anything like me, you’ll be delighted at the chance to simply have a look inside the church and see what’s going on and how the redevelopment is progressing, but you’ll also have the chance to learn about the reinstatement of the modified glazed screen below the organ loft. I’m pretty sure that the screen used to be part of the entrance porch for St Marie’s, but I’m happy to be corrected. The workshop will be lead by our joinery experts from John Turner Construction Ltd. Places are very limited for this workshop (there’s a maximum of 5 attendees) and will be distributed on a first come, first served basis. 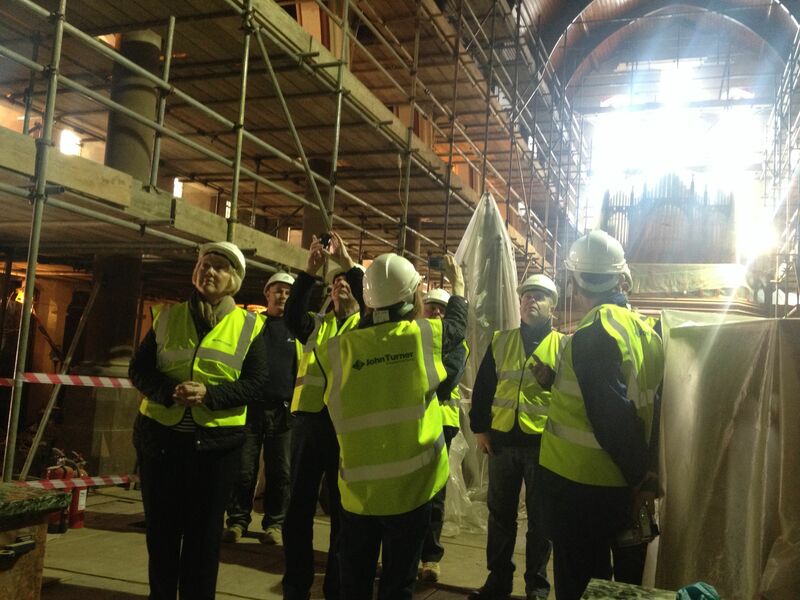 On Wednesday 12th March, our colleagues from Aura Conservation provided local residents with the opportunity to see their heritage experts at work on the redevelopment of St Marie’s Church. The topic for this Workshop was Repointing, Descaling & Marble Cleaning and it was attended by 11 people. Nearly all of the attendees felt they were more interested in the topic and local heritage generally after attending the workshop (with a few maintaining an existing 10 out of 10 appreciation for the topic). During the workshop we were guided by Gareth Liddle from Aura Conservation and got to watch master craftsman Tom Roberts in action. – Very impressed with the skills and techniques being used. – It was very good. I’ve done pointing, but not like that! – I thought it was really informative and nice to see the difference the work is making and that it’s being done sympathetically. – I was very moved by seeing the transformation. I loved Tom’s craftsmanship and expertise. – Fascinating to see the level of care taken over the pointing. 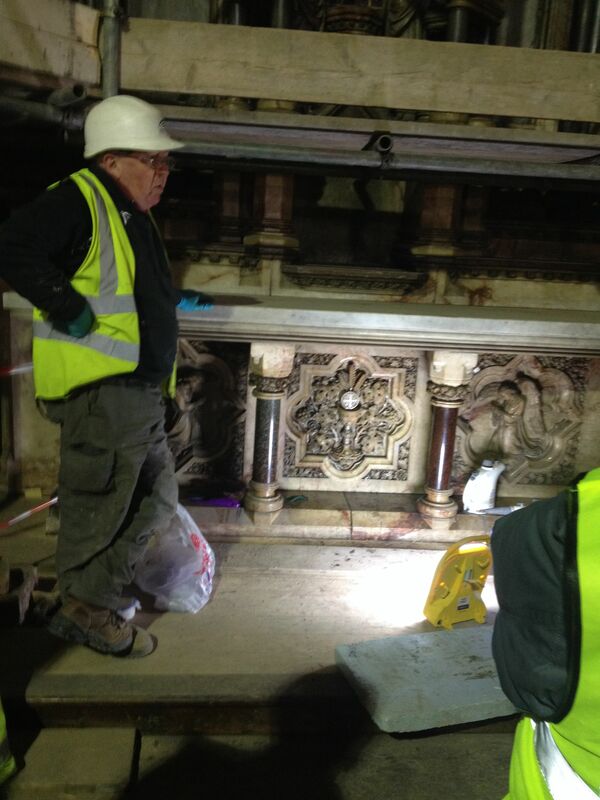 Very interesting to hear and see the marble cleaning. – I enjoyed it. Great to see it in it’s different stages. – Inspiring to see it all coming back to life. – It’s amazing how time consuming the work is. – Very well organised. Fascinating. I learnt a lot about the skills involved. – it was really informative. Everything was explained brilliantly. – Very interesting and very informative. 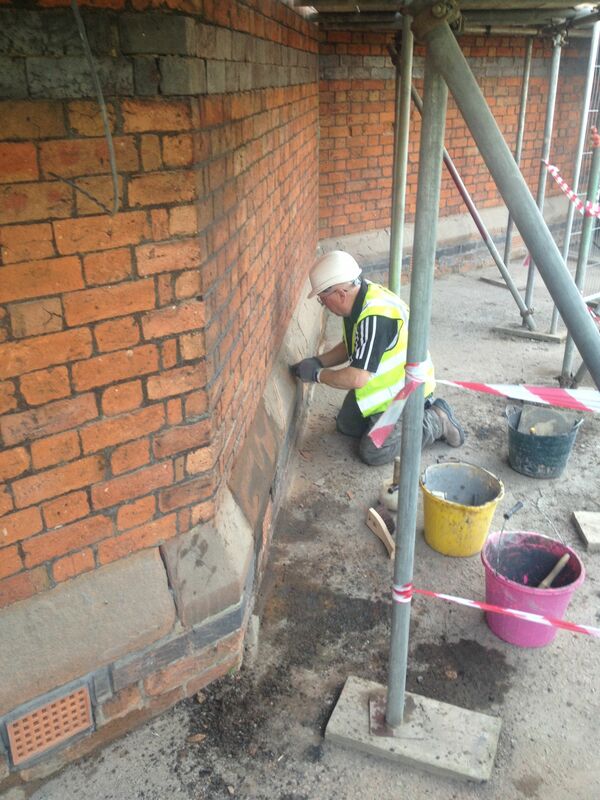 Tom in repointing action seen here “raking out”. 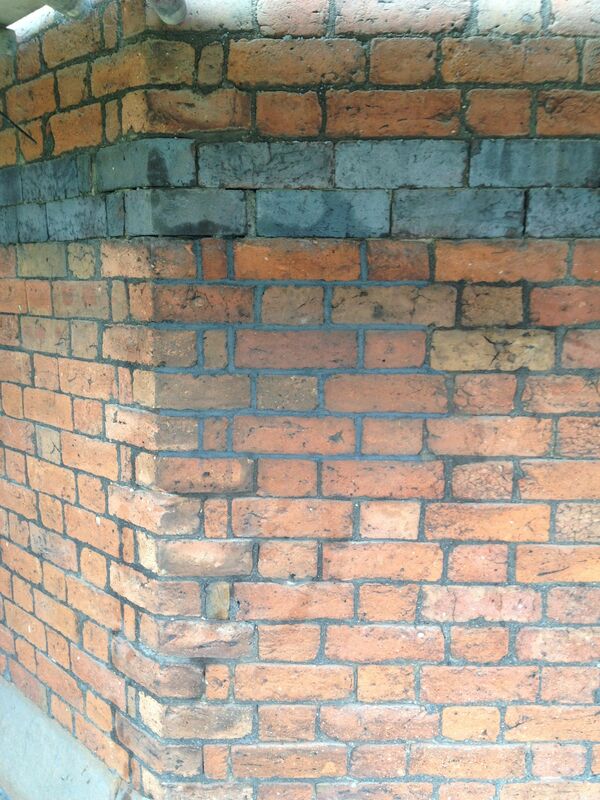 A freshly repointed wall and a job well done. The guys see inside the church for the first time. from L to R: Steph, Tommy, Gareth, Peter and Tony. The view inside the church. I’m sure we left an altar in here somewhere. There’s more marble to clean than the team imagined. It’s another job well done. Thanks Tom! Many thanks to Gareth and Tom for taking the time to share their expertise. On Thursday 6th and Friday 7th March, Silvano Cioci, from North West Murals Ltd provided local people with some superb workshops which explained the process he follows whilst restoring a painting. Silvano generously allowed us to film him whilst he provided this brief overview of his work. Thanks again to Silvano for being so generous with his time.